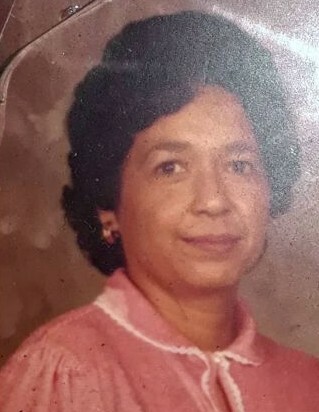 Margarita (Gonzales) Garcia, 82, of Beeville, died Monday, Sept. 10, 2018, at her residence. Mrs. Garcia was born April 14, 1936, in Pettus to Manuel C. and Elena (Moreno) Gonzales. She married Bencelado R. Garcia Sr. and was a Catholic. She was preceded in death by her spouse; her parents; two brothers, Santos Gonzales and Manuel Gonzales Jr.; one sister, Maria Luisa G. Rodriguez; and Great granddaughter Desiree Nesi Morris . Survivors include a daughter, Carmelita (Manuel) Flores Soto of Abilene; sons, Cresencio “Chris” (Maria) Flores of Fort Worth, Juan Antonio “Tony” Flores and Bencelado “Benny” Garcia Jr., both of Beeville, Jovention “Joe” Garcia and Matias “Matt” (Lola) Garcia, both of Abilene; step daughter, Norma Jean Garcia of Berclair; sisters, Maria Christina Reese Hudgins of Oklahoma City, Oklahoma, Maria Patricia Gonzales Almaguer of La Vernia; Martina Gonzales of Willow Springs, North Carolina, Maria Elizabeth Gonzales of Savannah, Georgia, and Delia Gonzales of Abilene; and a brother, Mauro Moreno Gonzales of Abilene. She is also survived by 27 grandchildren, 48 great – grandchildren, 6 great – great grandchildren; and a host of other relatives and friends. Visitation was held from 4 to 9 p.m. Thursday at Treviño Funeral Home with a rosary recited there that evening at 7 o’clock. The funeral Mass was celebrated today (Friday) at 10 a.m. at St. Joseph Catholic Church with Father Richard Gonzales officiating. Burial was private.